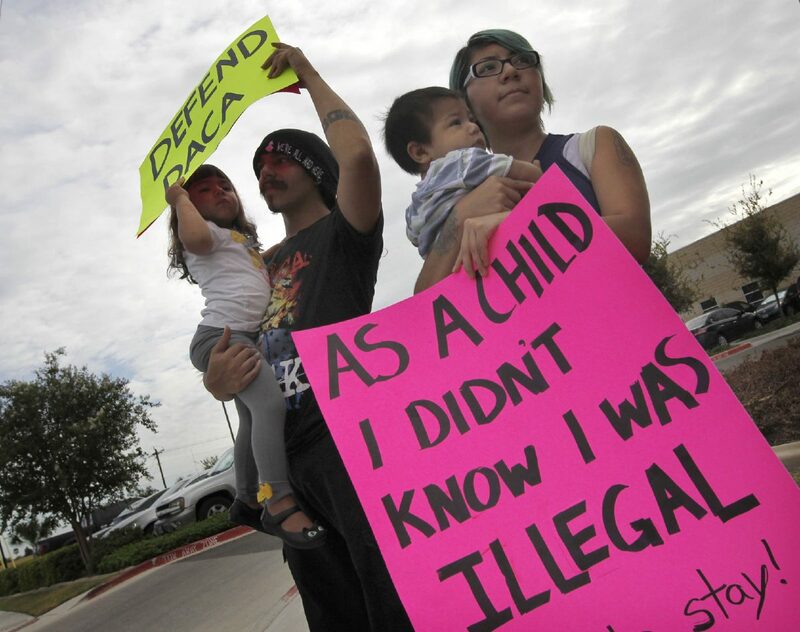 McALLEN — While clutching her 11-month-old baby boy in one arm and a protest sign in the other, Kathia Ramirez stood outside the office of the Texas Attorney General on Tuesday to boldly express her support of a federal program that’s designed to help her and others like her. 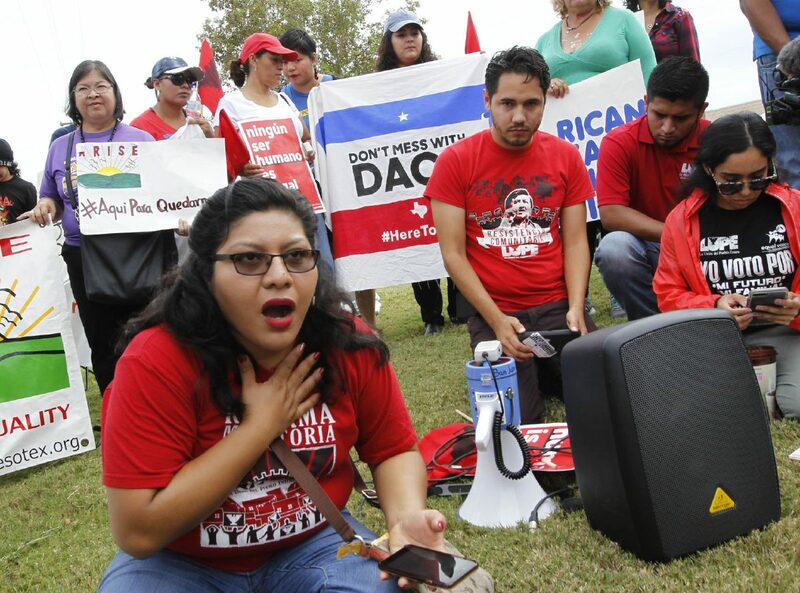 Ramirez, a recipient of Deferred Action for Childhood Arrivals program since 2012, was outside the AG’s office in McAllen to voice her displeasure over Tuesday’s decision to end DACA. A month removed from being renewed for a third time, the program shielded Ramirez and nearly 800,000 undocumented people across the nation from deportation. “I feel like everyone who has DACA should make it a point to go out to the streets and show that we matter — that we’re not in the shadows anymore,” the 24-year-old mother of two said moments before U.S. Attorney General Jeff Sessions announced Tuesday morning that DACA would be rescinded. The mood outside the AG’s office in McAllen leading up to Sessions’ announcement on the program — which provides protection from deportation for 125,000 Texans of the aforementioned 800,000 — was lively and optimistic, with protesters shouting slogans of unity and defiance. The energy quickly shifted to sadness and anger as Sessions delivered a clear message that not everyone who aspired to live in the United States could live in the United States. The decision to scrap the program will also leave the nearly 1 million DACA recipients potentially more vulnerable after having already voluntarily provided their personal information as a program prerequisite. According to a White House statement, the announcement Tuesday will not impact current DACA recipients until after March 15, 2018, six months from now. No new DACA initial applications will be accepted beginning Tuesday, but current DACA permits are still valid until they expire. For recent college graduate Abraham Diaz, the notion of potentially returning to an undocumented status takes him back to his pre-college years, when the uncertainty of his future weighed on his entire family. Diaz, 24, first successfully applied for the permit in 2012 and is due for a third renewal by the end of this year, which he will be able to apply for under the current terms. But even if he receives another two-year permit, it is his long-term status that is of concern. Diaz’s goal is to continue working to pay his way through a master’s and even a doctorate degree and one day become a history professor. Although it’s part of his plan, he doesn’t know if he could find a decent-paying job without the permit that allowed him to become the education specialist for La Union del Pueblo Entero — or LUPE — a local immigrant advocacy organization.